Just when we were getting used to having open streets events every weekend. Now with bridge and street design projects at critical meetings, it is time to show up and let your city government know that you support livable streets citywide! Tuesday – The city of Los Angeles Bureau of Engineering’s sidewalk-deficient Glendale-Hyperion Bridge design goes to a vote of the full City Council. It’s item 7 on the agenda [PDF], meeting starts at 10 a.m. at L.A. City Hall. Wednesday – Bike SGV encourages people who live, work or breathe in the San Gabriel Valley to attend Temple City’s meeting on its new design for Las Tunas Drive. Temple City has planned a road diet on Las Tunas, but is now considering scaling back some improvements. Please attend the meeting if you are in the area. Meeting is at 7 p.m. at 9701 Las Tunas Dr, Temple City. Details at Facebook event. Saturday – Give your ideas at an information session for new pedestrian signage for Central Avenue. Meeting is 10 a.m. to 12 noon at 4301 S. Central Avenue. Details at Facebook event. 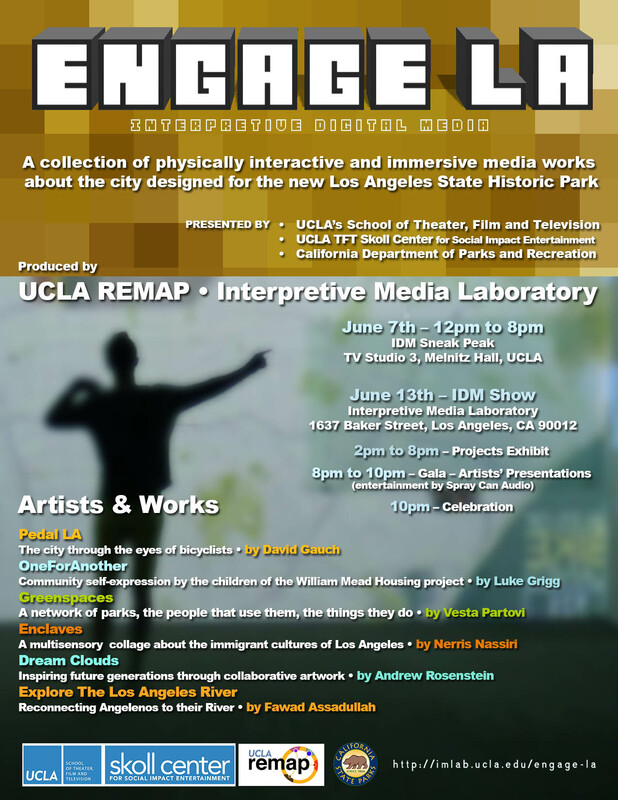 Saturday: explore Pedal L.A.’s digital media installation – this Sartuday June 13 at IMLab in Chinatown. Click for larger image. Saturday – Check out Pedal L.A.’s immersive interactive digital media installation all about how bicyclists make their way through Los Angeles. Read a preview at this earlier SBLA article. Pedal L.A. is one of six Engage L.A. interpretive installations showcased at this Saturday’s media showcase, taking place from 2 p.m. to 11 p.m. at the Interpretive Media Laboratory across from L.A. State Historic Park at 1637 Baker Street, Los Angeles CA 90012. See flier for details. Did we miss anything? Is there something we need to know for future calendars? Email joe@streetsblog.org.